Collecting cash to crush cancer. 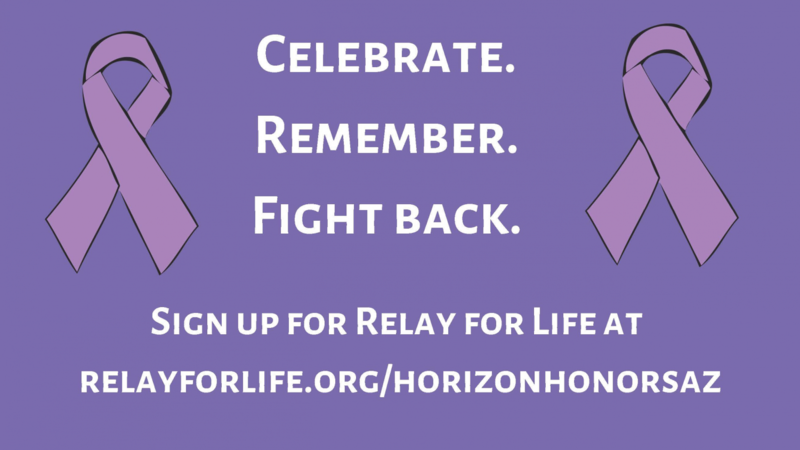 Horizon Honors has begun to fundraise for its annual Relay For Life, supporting the American Cancer Society. Relay for Life is a walk that helps raise money for cancer research and to support those battling cancer. During February and through March 8, there will be countless opportunities to help support the cause and get involved. On Feb. 8, from 5-9 p.m. Horizon Honors is hosting the first ever Trivia Night in the MPR to help promote and raise awareness. Join your relay team, parents, teachers, and fellow students for an exciting night of trivia. Make sure to study up and and bring your knowledge and brain power. There is a $30 entry fee per 4-6 person team, and the winning team receives a $10 gift card per player. To sign your team up, go to this website and make sure to save the date! On Feb. 19-22, Horizon Honors will be selling items in the “Kiss Cancer Goodbye” fundraiser in the high school courtyard. They will be selling Pura Vida Bracelets for $5, water bottle stickers for $2, and Hershey Kisses for $1. Make sure to stop by and make a donation to help find a cure. With over $1,000 already raised at the Crush Cancer basketball game, the Relay for Life event leadership teams are also collecting donations in the front office. This can come in the form of cash or even gift cards to places like Amazon, Costco, or Sam’s Club. You can turn in your contribution to Mrs. Shaheen’s box outside of her office. Friday, Mar. 8, Horizon Honors will be hosting its annual Relay for Life event to fundraise for the American Cancer Society. During the event, you and your team will help raise money for cancer research and acknowledge those who lost their battle with cancer, those who survived, and those who continue to fight each and every day. All ages are welcome to sign up and participate—from students, to parents, to staff! Create a team and encourage your friends to sign up on this website.